Soak away cares in the hot or pool at the Ramada Hinton where breakfast and Wi-Fi are free. All 104 rooms at the four-story Ramada Hinton come with microwaves and mini-fridges as well as flat-panel TVs and free Wi-Fi. A continental breakfast is served on the house each morning and guests can relax after a long day of travel at the heated indoor pool or the hot tub. Perk up with a snack from the vending machines after a workout in the fitness room. Parking is free. 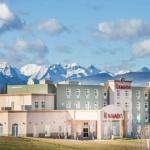 The Ramada is across Yellowhead Highway from the Hinton Golf Club. William Switzer Provincial Park is 15 miles north along Highway 40 and the edge of Jasper National Park is about 10 miles away. Hinton's Wild Mountain Music Festival is held every summer six miles away. Edmonton International Airport is 198 miles east.